Only you will know that your height is being boosted in these trendy Vermont elevator sneakers. These sleek tall men shoes will discreetly add up to 3.1 inches to your height, letting you head out on your day off with comfortable, casual sneakers on your feet. Featuring a brushed gray calfskin suede upper with white leather detailing and bright white laces, these sneakers kick it up a notch with the extra trendy feature of leather lace knots at the back of the shoe, giving it the edge over other sneakers. These elevator shoes for men will give you everything you want from a shoe; comfort, style and a few extra inches in height. 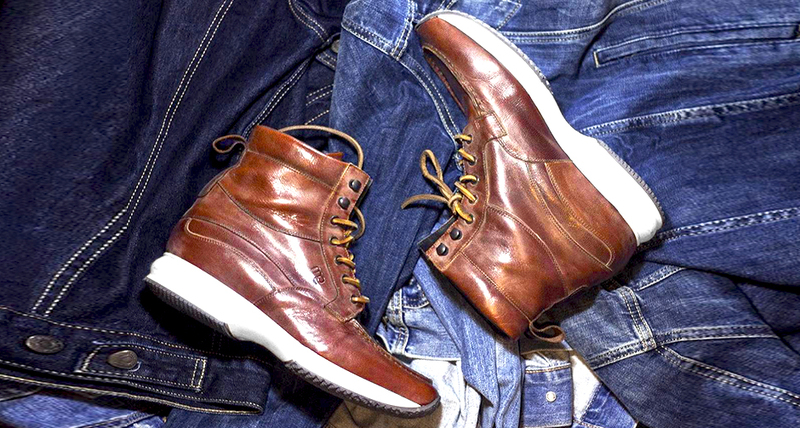 Wear them with your jeans or shorts for a laid back weekend style. Let your footwear do the talking with these stunning sneakers. The New Hampshire sneakers are elevator shoes with attitude as well as glamor. Not only are these shoes that make you taller by 2.6 inches but they are the ultimate in luxury sneakers. They are handcrafted in white patent leather but the elegance is in the brown crocodile leather detailing that can be found on the heel, toe and tongue. The exotic leather addition adds a touch of luxury to a casual shoe, which will make it stand out wherever you go. This is a must-have style for any shoe lover. These elevator shoes will enhance any casual outfit and would be a fantastic addition to your weekend wardrobe. Our Lincoln Road style is the ideal footwear to make your weekend more enjoyable. Get out there and enjoy yourself with these comfortable elevator shoes that feature a tan leather upper and goatskin leather insole. The lightweight rubber sole is anti-slip, making them great for all seasons and terrains and the leather laces and boot design of these sneakers will give you more support and comfort, so you can spend even more time having fun on your days off, whether you’re out at the park with your family or heading out for a casual bite to eat. These handmade Italian sneakers can be ordered in heel heights ranging up to 4 inches, so you can boost your height significantly but as always, discreetly. The only one who will know about your tall men shoes is you, unless you tell them.